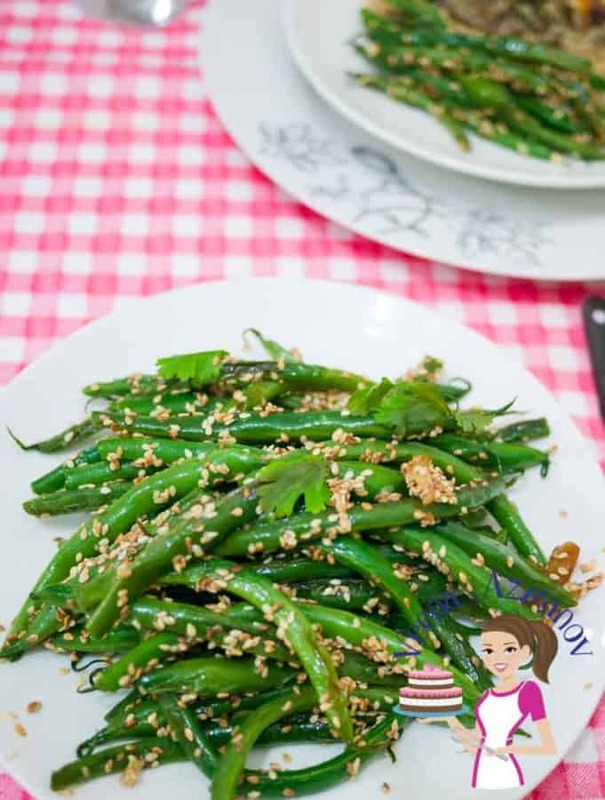 Nothing beats a side dish such as these sesame green beans that are simple, easy and effortless. An absolute winner with family, or guests. Lightly flavored with garlic and tossed with toasted sesame seeds for that added flavor. These make a perfect side for any main course. 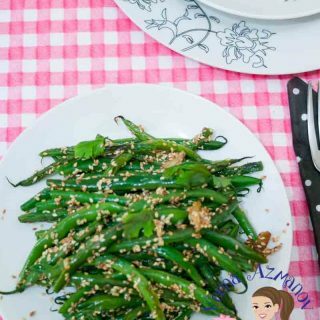 These sesame green beans have got to steal your heart. My kids love these because they are always the best side dish you can have when serving meat dishes. 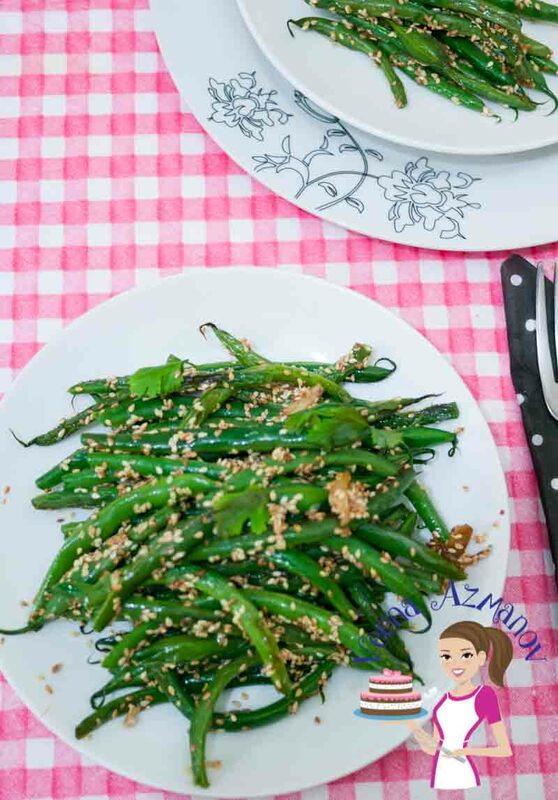 Often I will make a pan-fried dish with a side of my skinny mashed potatoes and these sesame green beans. 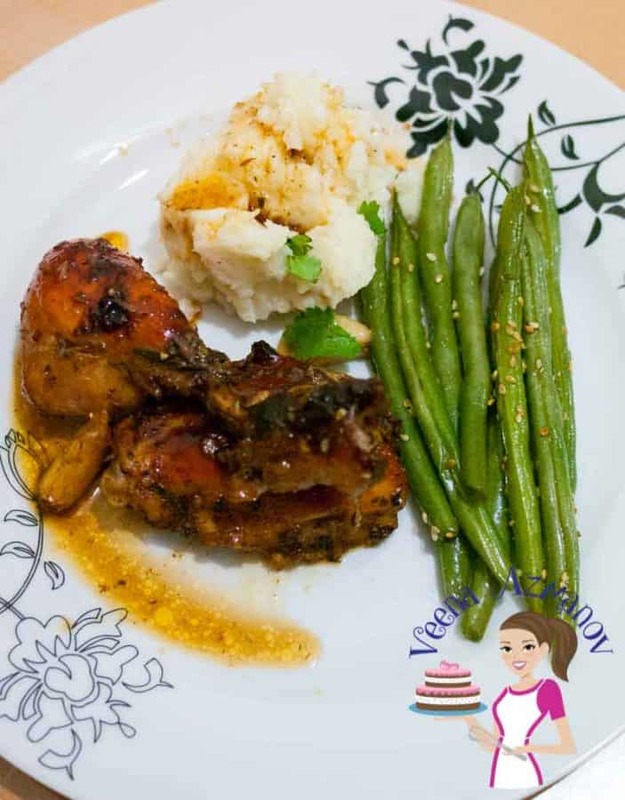 Here’s my dinner from this weekend -again my Skinny Mashed Potatoes with Honey Soy Chicken and these easy sesame seed beans. Believe me, this meal was done in less than an hour. I grew up with veggies as the most important part of dinner. Mom would always say to us, your meal can stay on the table but your veggies need to be eaten fresh. That’s what gives your both most energy. Now I say the same to my kids. In fact, we eat meat only thrice a week, in fact sometimes only twice. Fish twice a week and the rest is vegetables. This has resulted in my kids eating all veggies. Weather is broccoli, eggplant or cabbage salad. You must remember my post 15 Easy Healthy eating habits for your family. I do bring salad and veggies on the table before I bring in the meats and bread. This gets the kids with a head start with veggies and salad so I don’t really have to convince them of much. Trim wash and pat dry the green beans. Heat a wide pan on the medium heat. Add the Sesame Seeds and toast gently on medium to low – set aside. To the same pan add olive oil to the pan along with the garlic – cook a few seconds. Add in the green beans. Toss well with two flat spatulas so the beans are coated with the oil. Add about 2 tbsp of water. Cover the pan and let cook on medium low for no more than 3 minutes. Any more than three minutes and you will lose the lovely green color of the beans. Optionally you can cook the beans uncovered for longer. If using add lemon juice now. Lastly, add the Sesame seeds and toss well. Remove from the heat and out of the pan to stop further cooking. Add the sesame seeds and toast gently on medium to low - set aside. To the same pan add olive oil to the pan along with the garlic - cook a few seconds. Add about 2 tbsp of water. Cover the pan and let cook on medium low for no more than 3 minutes. Any more than three minutes and you will lose the lovely green color of the beans. Optionally you can cook the beans uncovered for longer. After three minutes - check the beans. Cook a bit longer but uncovered - usually they take about 5 to 6 minutes. They should still be firm but tender enough to bite into - Al Dante'. Now that’s a light dinner for me today! 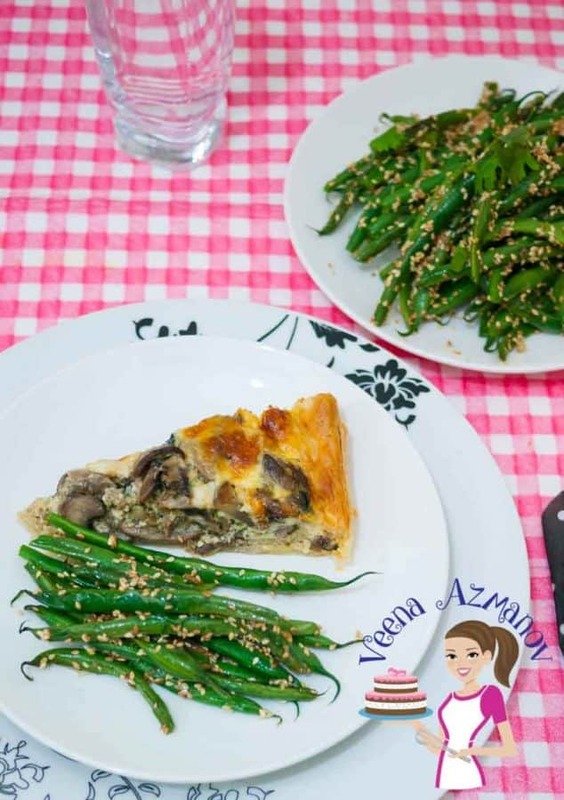 I love the Mushroom Quiche Recipe. You must check it out. Do you love cooking? 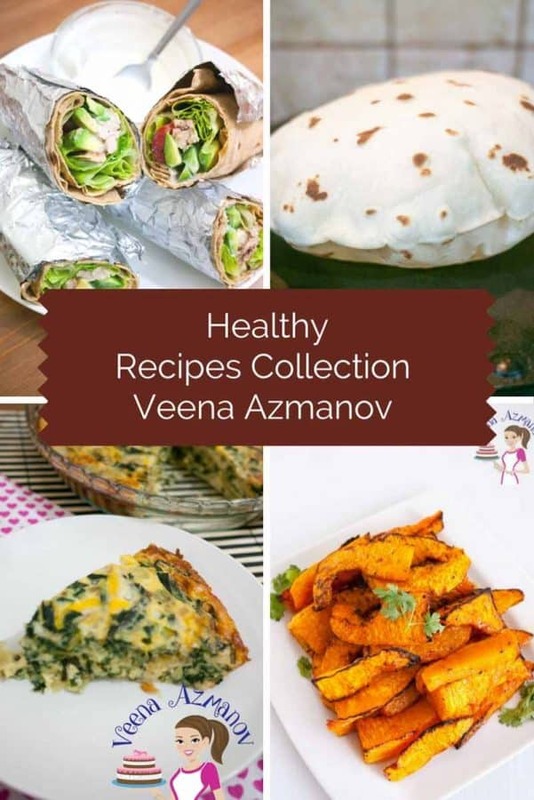 You may like to check out my other recipes too. Click here to see my Recipe Index to see all recipes at a glace on this blog. Don’t forget to bookmark it for later. We love green beans and this looks like a perfect side dish. I have never tried adding garlic along with green beans. Cant wait to give this one a try! I just bought a big bag of green beans and this looks like the perfect way to prepare them! Love that combination of sesame seeds, garlic, and lemon. I can think of so many dishes that this would make a great side for! Than you, Amanda. Yes, this is one you will love even if you don’t like veggies much. Perfect little side dish! love the addition of the sesame seeds and a hint of lemon is always amazing! Makes the flavor pop! Yum! I love green beans and sesame seeds. I think this is a wonderful side dish for any meal! These seem so simple but I know they have a lot of flavor. Adding them to my menu this week. These look fabulous! What a treat! Can’t wait to try your recipe! Fresh green beans are a side that I make on the regular. I really like this recipe with the sesame seeds in it, would be great with some chicken stir fry. Thank you Sharon. We love green beans in our home too! Love this! Always looking for a new way to add something fun to my veggies. These look delicious! I love simple sides that are dressed up like this. So good! I especially love sesame. Such a good flavor! 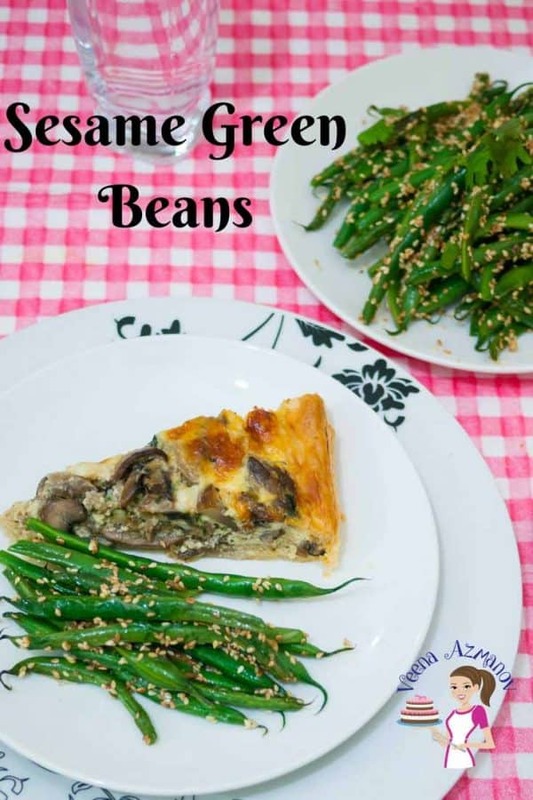 These sesame green beans are perfect! They are easy and delicious! I used to not like green beans but that’s only because we used to have canned a lot growing up, but I’ve developed a love for fresh green beans and I can’t wait to try your delicious recipe! Thank you Elaine. I have never had canned green beans. The way you prepped these green beans is a perfect way to zing up some normal vegetable fare. I think these look absolutely delectable. Thank you Ben. We do love bean like this. It might be simple, but I know it is full of flavor! Love the sprinkled sesame on top as additional crunch and nutty element. I agree on the veggies, they are the most important part of my meals every day. Green beans dont’ need much for the flavor they are so delish just simply with salt and pepper I think. I absolutely adore green beans cooked with garlic. These are awesome, and the addition of sesame seeds is genius. I love your strategy of serving a salad first. It’s so important for kids to start eating veggies early. I’ve shared your 15 Healthy eating habits, and this post on my Facebook page. Great recipe. Thanks for sharing it with us.